Last month [November 2007] the Sentinel gave a report on the ‘Citizens of the Year Awards 2007 for Stoke-on-Trent and North Staffordshire’, a scheme designed to reward ordinary people for extraordinary achievements, with categories including ‘Entrepreneur Award’, ‘Community Improvement Champion’, and topped by the ‘Citizen of the Year’. The awards are extremely popular with local people and dignitaries, and the awards ceremony is a highlight of the local civic calendar. On reading through the categories and awards made, I was intrigued to note that the first one was dedicated to excellence in the design of the built environment, the ‘Architectural Design Award’. Keen to know the identity of both the building and its architect, I read on, only to be disappointed that the award-winning structure was a set of gates and railings at the new “eco-school” in Hanley, Waterside Primary. I have no beef with the railings in question, or railings as an architectural feature, and I do not wish to belittle the achievements of their designer, Dennis O’Connor. But surely we should expect that an award that celebrates architectural achievements would go to a building or landscape? I also seem to recall an awards ceremony in recent times, organised by a local regeneration agency, where the recipient of an award for innovative design in regeneration (or something of that manner), was Dransfield Properties for their monstrous ‘Jasper Square’ scheme in Tunstall; a series of soulless sheds, that sits uncomfortably with the A. R. Wood legacy it neighbours. It is incredible that at a time when the city is undergoing major change, and the subject of multi-million pound regeneration programmes, we cannot seem to produce a new building worthy of celebration, even at a local level. Is it because we have come to expect and accept mediocrity? The Victoria Hall dates from 1888, and was the brainchild of the Borough Surveyor, J. Lobely. Built in local red brick and terracotta, the classical Grade II Listed venue originally held 2,800 people, and has, over the years been the scene of numerous concerts, wrestling contests, boxing matches, and many rock gigs. I can personally testify to the hall’s legendary acoustics, having witnessed two of the city’s great gigs of modern times there: Primal Scream in 1994 and Suede in 1995. By the mid 1990s though, the building, along with its parent town, had become tired and run-down and in need of some serious attention. The City Council identified the Victoria Hall – which although in need of a revamp was still operating successfully as a touring venue – as the potential catalyst of a cultural resurgence. A planned revamp of the Victoria Hall, along with plans for a new theatre through the conversion of a stunning Art Deco cinema, and a raft of public realm improvements, formed the City Council’s ‘Cultural Quarter’ initiative. Levitt Bernstein were selected as architects for the scheme and produced a stunning adaptation and extension of this great building, providing first class new facilities. The new Victoria Hall opened its doors in 1998, and has since been able to exceed all of its visitor targets. 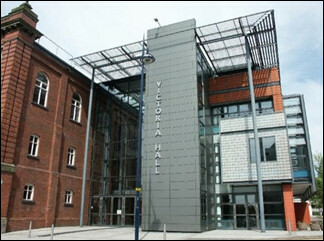 The Victoria Hall extension is considered by many to be a nationally important example of how to extend an historic building without resorting to pastiche, and is certainly the most important architectural work in Stoke-on-Trent for many years; unashamedly modern, yet traditional too in the way materials common to the area are utilised, though with a contemporary twist. The principle behind this approach to extending a building is not new, and the Victoria Hall extension follows a trend that was started by the Georgian extension of the timber-framed Ford Green Hall many years ago. However, as with the Millennium Dome, its achievements have been dented and overshadowed by the political fallout caused by the apparent mishandling of the Cultural Quarter initiative, the legacy of which may well limit the local authority’s appetite for involvement in major projects for years to come. This is a great shame, as the Cultural Quarter’s real legacy is this outstanding piece of modern architecture.